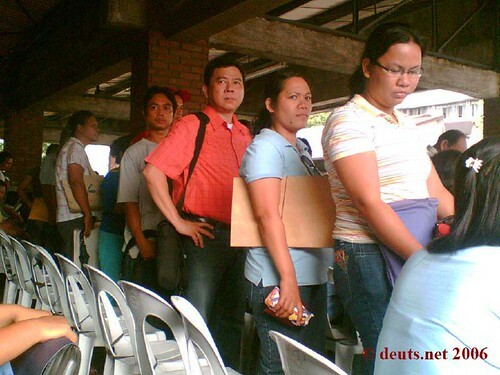 Thousands of Filipinos are joining that queue each day, which supports the statistics showing that around 3,000 Filipinos are leaving for abroad everyday. I wonder why they have not yet even devised a plan to get rid of that daily scene at their office. Surely, there has to be a better and more efficient way to handle those authentication procedures. One need not waste his/her entire day just to complete the process at that lousy place. Posted on June 26, 2006 by deuts. This entry was posted in General Discussion. Bookmark the permalink. Ito ang mga klase ng sistema na dapat baguhin ng ating gobyerno! Kawawang Pinoy, sana nagamit sa mas makabuluhang bagay ang pagpila nya ng napakahabang oras! Mind you. The queue at the DFA (Department of Foreign Affairs) is another story. And also, at the embassy, they are a total pain in the a55! A total waste of time!